The Monarch Kitchen Island blends upscale design with state-of-the-art functionality. Stylish design features include a solid hardwood, distressed Oak finished top with profiled edges and a black granite inset; framed side and back panels; and a , Antiqued White sanded and distressed finish over hardwood solids and engineered wood. Functional elements include two storage drawers and a storage cabinet with four adjustable shelves. What makes this island really unique is the hidden sliding mechanism connected to the back two shaped and turned posts. The mechanism provides easy mobility and independent movement of the two posts for expansion of the breakfast bar. The 15.5 inches breakfast bar extends the top surface from 25 inches to 40.5 inches. Either with the breakfast bar closed or in use, this piece has a polished look by being consistently styled on both the approach and working sides. 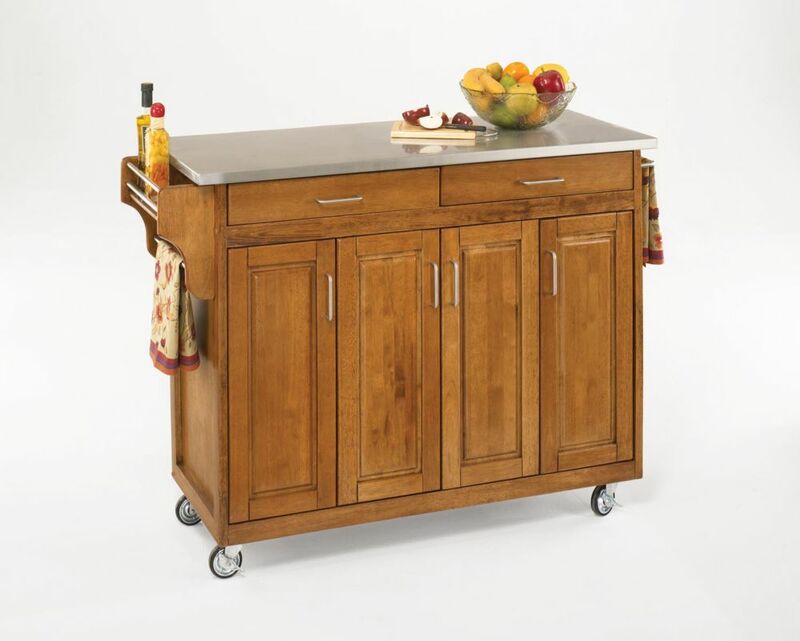 Create-a-Cart Cottage Oak Finish Stainless Top is rated 3.8 out of 5 by 6. Rated 5 out of 5 by Anonymous from Great cart! Make time for assembly! This is a great cart for the price! It is perfect for my smaller kitchen. The only thing I would caution anyone when deciding to purchase is that it diy and you will need ample time and patience when putting it together. Rated 5 out of 5 by Mike from Excellent - better than I expected. Easy to assemble with good instructions. Made in Thailand which is obviously better than Chinese. Rated 5 out of 5 by paramedicma from Solid cart Past reviews are effetely harsh for this cart, the cart is great quality for build your own and has solid wood doors. Some of the components are lower end, i.e. hinges, but it went together fairly easy, all the holes lined up once the wood was pushed back in line as it was a little bowed. It came with extra hardware parts and even an allen wrench for your drill!! (no need to cut the one they give you). A couple of the anchors came out as expected, a little glue fixed it right up. I would however say it is a little bit on the difficult side, Maybe call it a 6/10 for difficulty. I recommend a cordless drill. Rated 4 out of 5 by JIMBO from Looks good when completed. The unit looks good but is difficult to assemble. i spent some 10 hours doing so. The top did not fit because the tolerances were too close, preventing opening and closing of the drawers. I had to improvise by shimming the top to facilitate proper operation.